According to the Dawn, Aziz as saying that the foreign secretary-level talks between the two countries could be rescheduled soon after the visit. 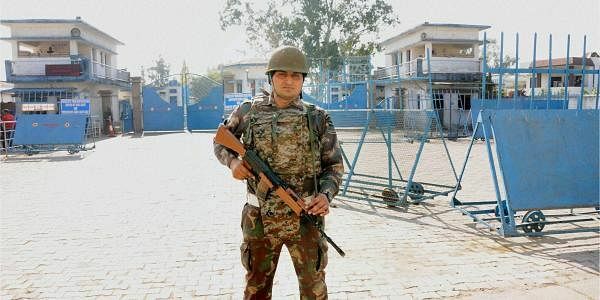 A Security forces jawan guards at the Pathankot Air Force base after the end of the military operation against militants on Tuesday. LAHORE: Pakistan Prime Minister's Advisor on Foreign Affairs Sartaj Aziz said that talks with India are likely to resume after a team visits Pathankot in the upcoming days, to investigate into the deadly attack on the Indian Air Force Base. According to the Dawn, an official transcript released on Tuesday quoted Aziz as saying that the foreign secretary-level talks between the two countries could be rescheduled soon after the visit. After a meeting with US Secretary of State John Kerry on Monday, Aziz said expressed his disappointment over the current state between the two hostile neighbours, saying that it was unfortunate that the Pathankot attack disrupted the resumption of secretary-level talks between India and Pakistan. He pointed out that since the attack, Pakistan had taken a number of “important steps” for resumption of these talks. “Prime Minister Nawaz Sharif called the Indian Prime Minister (Narendra Modi) immediately after the attack and assured him of Pakistan’s support in the investigation. National security advisers are maintaining frequent contacts,” he said during the US-Pakistan Strategic Dialogue he co-chaired with Secretary Kerry. “A case has been registered and the Special Investigation Team (SIT) is likely to visit India in the next few days. We, therefore, hope that the foreign secretary-level talks will be scheduled very soon,” he added. Aziz also asserted that Pakistan decision to ‘reach out’ to India after the Pathankot attack was an important part of Islamabad’s strategy to improve ties with all neighbouring states. “We believe that the resolution of all outstanding issues — including the Kashmir dispute — is possible through resumption of full-scale and uninterrupted dialogue with India,” he said. Soon after the Pathankot attack, Pakistan set up a six-member Special Investiga­tion Team to follow up on the leads India had provided.